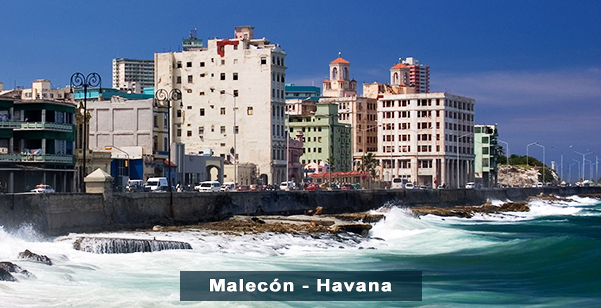 Accomodation: 4 nights in Havana - 3 nights in Varadero. Four nights accommodation in Havana, 4* with breakfast included, upgrades available. 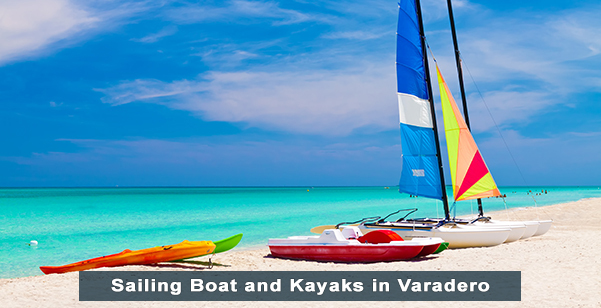 Three nights accommodation in Varadero, 4* all inclusive Beach Resort, upgrades available. Transfers Airport - Hotel - airport. International airfare, add airfare from any major City in Canada. Cuban departure tax $25 convertible pesos paid locally upon departure. Arrival in Havana. Our Representative will meet you and transfer you to your Hotel we use 4* Havana Hotels with breakfast included. Upgrades to a 5* hotels available. After breakfast your Guide will take you for a City tour of this fascinating Capital City. 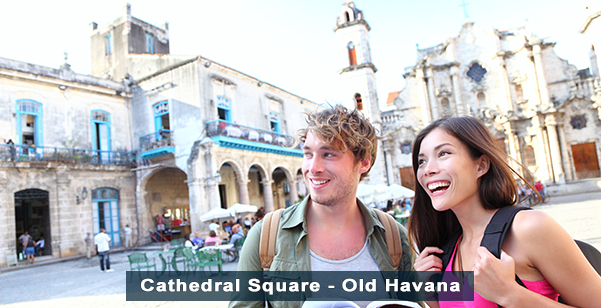 Founded by the Spanish in the 16th century, Havana is the capital city of Cuba. Attracting over a million visitors annually Havana is known for its warm tropical climate, beautiful architecture, history, and its many interesting arts and music festivals. Havana enjoys warm temperatures year round and you can expect to see temperatures anywhere from 20C to 30C. Havana is comprised of three areas; Old Havana, Central Havana and Vedado. Old Havana is a UNESCO World Heritage Site and has much to offer in the way of art galleries, elegant colonial streets, and beautifully restored buildings. Visit the Castillo de la Real Fuerza in the Plaza des Armas, this is the oldest bastioned fortress in the New World and is the leading maritime museum of Cuba. A popular attraction is the Malec�n; a roadway and seawall that runs along the Havana coastline and provides amazing views of the bay. 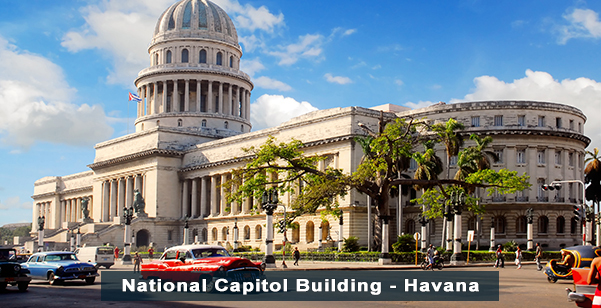 Including in your tour are visits to the University of Havana, Revolucion Square, National Capitol building, Great theatre of Havana "El Prado", the well known Parque Central, Cathedral Square, San Fracisco de Asis Square, The Arms Square, and the Palaces of handicrafts and Villanueva. Lunch included. Rest of the day at leisure. Overnight in Havana. After breakfast depart to Pinar del Rio the western most province of Cuba. It is known for its almost perfect natural beauty and has been called the "Garden of Cuba". 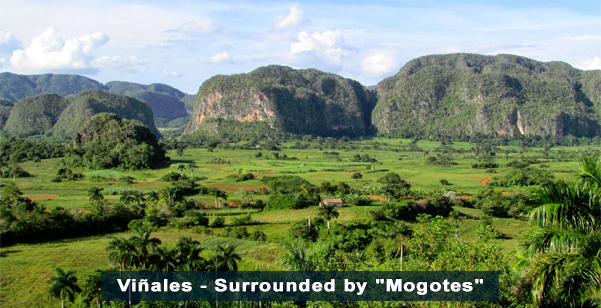 With its flat plains surrounded by "mogotes" (limestone mountains), the only hills of these kinds in Cuba, the area is a picture of beauty. Pinar del Rio is only 174km from Havana and is easily accessible by highway. The finest cigars in Cuba are manufactured here, made with locally picked tobacco from the Vi�ales Valley; they are the best cigars in the world. Two biosphere reserves are found in Pinar del Rio; Sierra del Rosario and Peninsula de Guanahacabibes. There is more UNESCO protected land in Pinar del Rio than there is in any other province in Cuba. The city offers amazing architecture and was the site of tobacco smugglers in the 18th century for its prime soil conditions. Continue on to Vi�ales Valley, and its town of the same name, is a beautiful UNESCO World Heritage Site in the Pinar del Rio province. Known for its traditional agriculture techniques, some of the best tobacco in the world is grown here. The valley is encircled by soaring mountains and features dramatic rocky outcrops throughout the landscape, many of the hill faces hide caves popular with hikers. Walking one of their many trails for bird watching and admiring the unique flora and animals unique to the Valley are some of the favorite activities when visiting the Valley. Stop at "Los Jasmines" lookout for breathtaking views. Lunch included at a local Restaurant, sample traditional Cuban cuisine. Return to Havana. Overnight in Havana. A Cigar Factory in Havana: Cuba is famous for its cigars and a tour of a Cigar Factory in Havana is a must see while visiting. Located in Old Town Havana the factory was built in 1845 and is the oldest cigar factory in Havana. Producing over 25,000 cigars every day, each cigar is manufactured by hand, from the weighing of tobacco leaves to the putting of seals on each box. Some of the most famous cigars of Cuba are produced here, including Lusitanias, Churchills, and the famous Romeo and Juliet. Your guide will educate you on how the cigars are made and how to tell a genuine from a fake. You will see the full process of the cigar, from the tobacco leaves arriving right from the plantation to the seals being placed on the boxes and sent out. At the end of the tour you can enjoy the bar and purchase some cigars from the factory shop. Lunch at your own leisure. Return to your Hotel. Rest of the day to enjoy by yourself. We suggest in the evening a visit to La Bodeguita del Medio Bar and sample the Mojitos of which they are famous for. This is also the former hangout of Ernest Hemingway. You can do this totally on your own no Guide required. Overnight in Havana. Havana Tropicana Show: The Tropicana Club is where the famous open air Tropicana cabaret takes place. 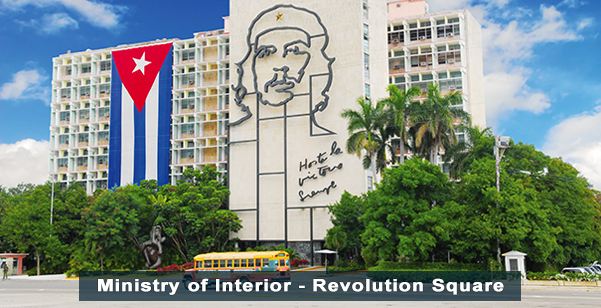 It is located in the Marianao neighborhood of Havana and is known throughout the world. Launched in 1939 on a six-acre suburban estate with tropical gardens, the Tropicana cabaret puts on a spectacular show featuring showgirls; conga sounds and is an overall flashy spectacular production of Cuban music and folklore. It's song and dance performance is reminiscent of 1950's Cuba and has been called a "Paradise Under the Stars". The Tropicana show takes place at 9pm every Tuesday to Sunday. 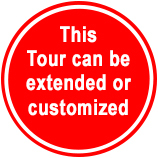 The tour includes preferred seating, welcome cocktail, Havana club Rum drink and snacks. Transportation not included. 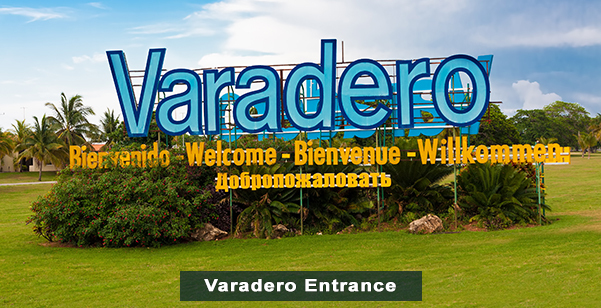 After breakfast your guide will transfer you to the World famous Resort area of Varadero. Just two hours drive is one of the largest resort areas in the Caribbean and is located on the Hicacos Peninsula, between the Bay of Cardenas and the Straits of Florida. 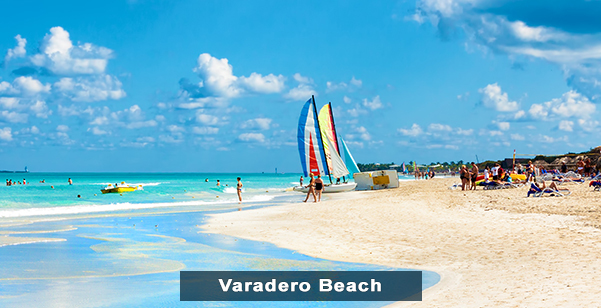 Varadero is the foremost tourist resort town in Cuba and features more than 20km of beautiful warm white sandy beaches and crystal clear waters This package includes a 4* all inclusive Beach Resort. Upgrades to 5* Resort available. 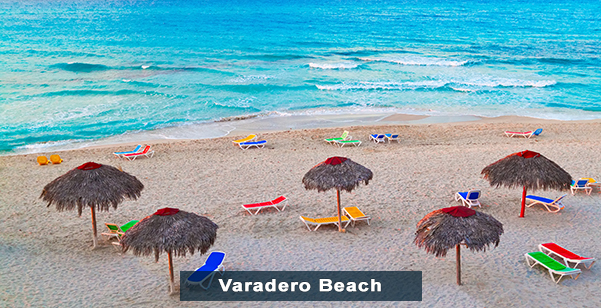 Rest Day at leisure to enjoy your Varadero beach Hotel. All inclusive Plan. Overnight in Varadero. Day at leisure at your all inclusive Resort. 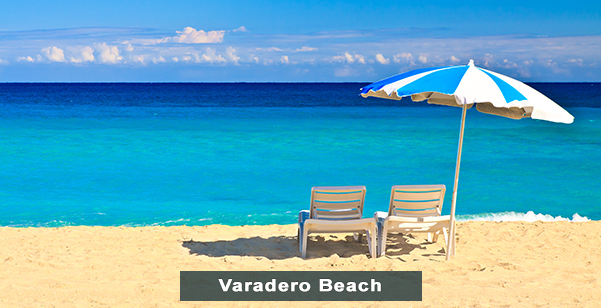 Relax in Varadero's beautiful beaches, explore the Town. All inclusive Plan. Overnight in Varadero. Day at leisure at your all inclusive Resort. You could purchase a day tour locally from the Hotel some suggestions are swimming with the Dolphins or a snorkeling Tour. All Inclusive Plan. Overnight in Varadero. Tour Ends. You could flight back from either Varadero or Havana. Your Guide will assist you with any arrangements. Platinumholidays.com specializes in cheap Cuba Tours and affordable Cuba Holidays. 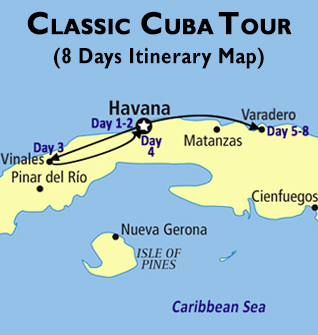 We offer 8 Days Cuba Guided Tours, Cuba tours for 10, 11 and 15 days, tours for 7 nights in Holguin. The cities we will be visting in our tours are: Havana, Cienfuegos, Trinidad, Santa Clara, Camaguey, Cayo Santa Maria, Santiago de Cuba and Holguin. Any type of tours to Cuba we have it, this tours can be customized to meet your needs and they have connecting flights available from major cities in Canada. Plus our tours have Private Expert Guides and air conditioned vehicles. Copyright © 2014 platinumholidays.com. All Rights Reserved.